and around the world, with an emphasis on sports photography. This photograph was taken at Greenwich Park on the cross-country day of the equestrian event during the London 2012 Olympic Games. I arrived at the park very early, and as I knew what I had to photograph for the majority of the race I positioned myself at the start of the course and worked my way along, ending up at the water jump, where I remained for most of the day. I photographed each rider coming through the water jump, and although it was a nice picture with Greenwich Observatory in the background, after doing the same shot over and over again for 30-40 riders I thought I had to move on, so I went further down the course. By then it was about 4pm and I made my way to the top of the spectators’ stand, where I could get a wideangle shot of the whole event with the river and Canary Wharf in the background – what we call a general-view picture. 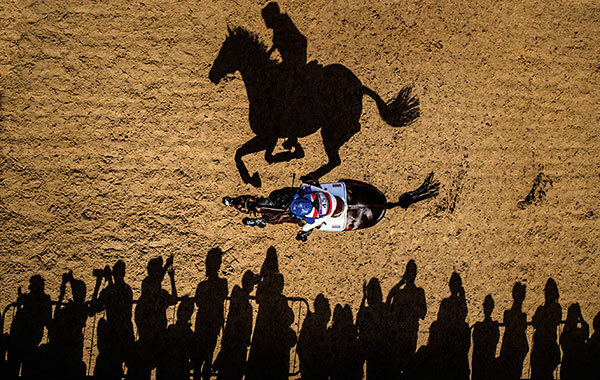 I did my wideangle shot, and as I didn’t quite get the first version quite right I put my camera down to wait for the next horse – there was about an eight-minute gap between riders – and leaned over the back of the stand. I always do this in a high place – I lean over the balcony to give myself that feeling of vertigo! I’m not a massive fan of heights, but I just have to do it. As I leaned over I noticed all the shadows from the people walking past, and it made me wonder what that it would look like when a horse passed by. So I set my exposure to 1/2000sec at f/4.5 on my Nikon D4, and using a 70-200mm lens at 70mm I autofocused on the ground. Then I manually pulled back the focus to what I thought was about 8ft [2.4m] from the ground in order to get the rider’s head in focus, although it was a bit of a guessing game. I had the camera in motordrive as I always do for sporting events, and captured the first horse going through. However, after reviewing the frames I realised I had cropped off the rider’s head in the shadow as I didn’t anticipate how long the shadow was going to be. I then had to wait another eight minutes for the next rider, all the time thinking, ‘Hurry up before some other photographer comes along!’ Typically, the next rider fell off, so that meant there was another gap of eight minutes in which I was aware that the sun was moving and I was worried that the clouds might come across and ruin the shadows. The next horse approached – Thailand’s Nina Lamsam Ligon riding Butts Leon – and I fired away. Luckily, the spectators were still there and I got a frame where I didn’t crop the rider’s head off! When I reviewed the photo I knew that it was a good shot, so I decided to wait eight minutes for the next horse to see if I could improve on it. In the meantime, I saw a photographer coming up the steps to my position, so I turned around and pretended to shoot a wideangle view of the stadium as I didn’t want him to know what I was doing. As the photographer did his wideangle shot, I was willing him to hurry up and go as I knew I had a unique picture. The other photographer did see my shot, but by that time the sun had moved, the shadows weren’t quite the same and the people had gone. That picture really did last for just 30mins. It was just luck that I went to the right position, as no one could have predicted this photograph would be the result. When I reviewed all the frames later, there was only one shot that worked. Even with eight or nine frames a second in motordrive, there was only one where all the elements were in the right place to make the image balanced. There is almost a complete separation between the horse and rider and their shadow, so you get an almost complete shape of the shadow. The horse’s front feet are also in the air, adding to the composition. If the hind legs had been up too it would have been even better, but that was as good as it got. The frame before and after didn’t quite work, either, as the horse’s tail wasn’t right and the mane was in a different position. I knew instantly that this shot was a keeper and it is one of my best photos from the Olympic Games. What made it special was the fact that it’s very different. When you are working at the Olympic Games you are competing against 1,500 photographers, so to come away with a photo that is unique is pretty tricky. I’m immensely proud of this picture: it was a great feeling going into the editing hub the next day to see cuttings of my picture all over the wall. This image got a good run in the papers worldwide the next day, and it has won several awards, including Photograph of the Year in The Press Photographer’s Year 2013.